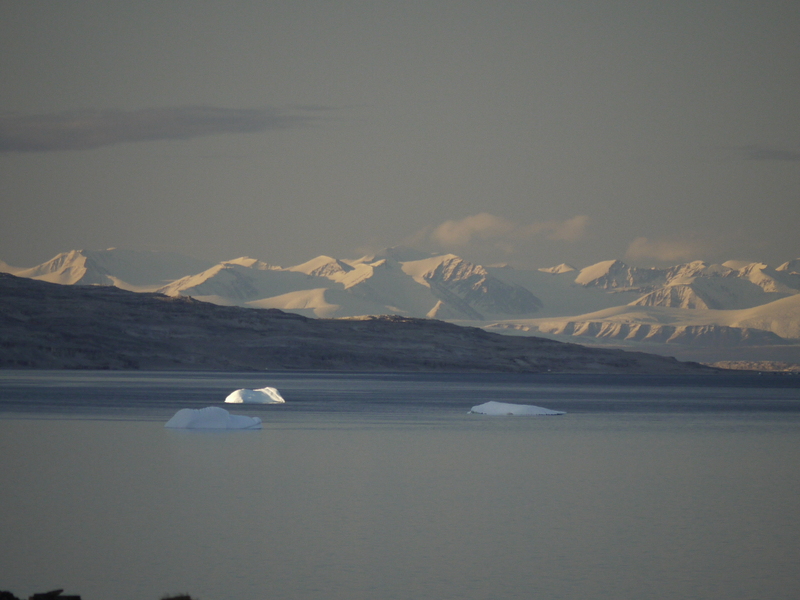 We’ve been home from our trip to Baffin Island for a few weeks now. I’ve been wanting to write a post about our trip, but its been difficult to put the experience into words. I wanted to write something more intelligent than a list of superlatives, but superlatives are what come to mind. It was an experience of a lifetime, for so many reasons. 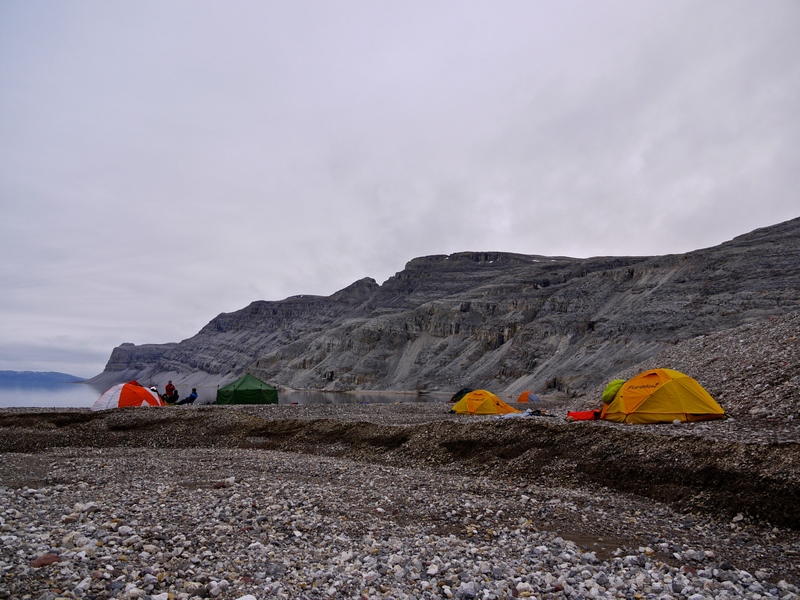 We kayaked for 2 weeks in a remote area of northern Baffin Island, some 75 km west of Pond Inlet. We were dropped off by motorboat, and spent two weeks meandering along the shore before being picked up again. 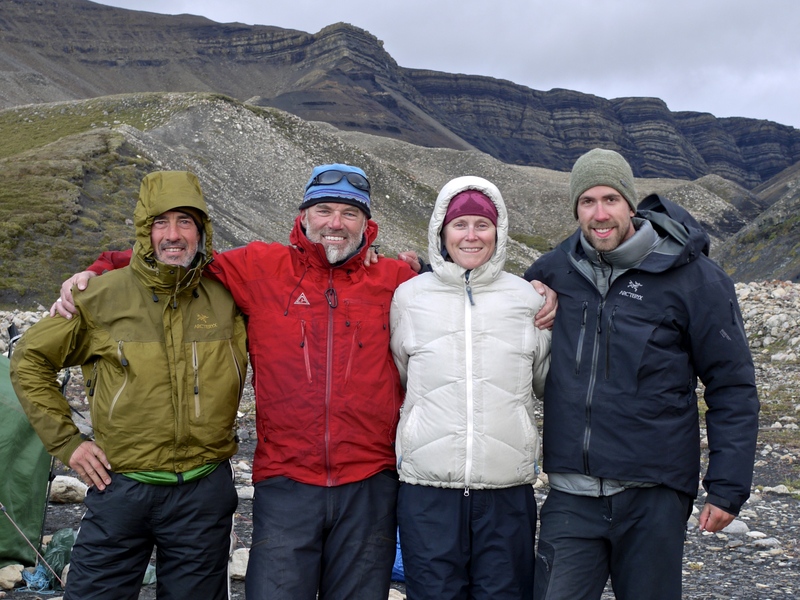 We were a group of 8 – our two Blackfeather guides, David and Kurtis, and the 6 trip customers, Martin and me, and 4 lovely Americans from various parts of the country. We were a great group – everyone was fun and friendly, and each person brought something unique and valuable to the group – Kurtis our fantastic cook and geology expert, David our northern guide, also a Pond Inlet local, with his vast, and thoughtful, experience in the north, Joyce with her birding knowledge, Ron with his hand lens showing us the wonders of the small Arctic plants, Peter with his eagle eyes who spotted amazing things before anyone else, Micheal with his wry sense of humor, Martin with his penchant for seeking out canyons and waterfalls, and me. 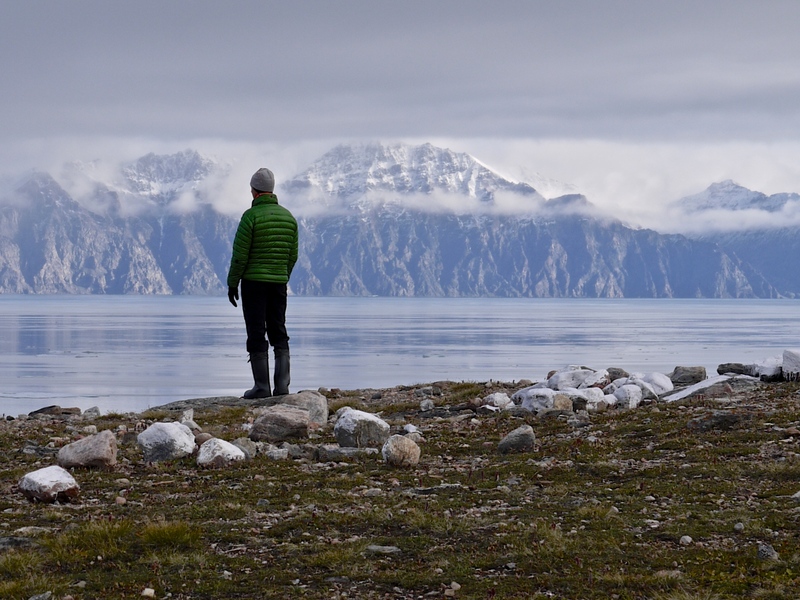 The scenery was stunning, with the far off and immense wall of jagged peaks of Bylot Island dominating our skyline. The sounds were immense, with huge cliff walls that towered over us. The land is mostly barren and rocky, although at times we came across areas near streams that were wet and green, and here we found the wildlife, feeding off the lemmings that live in the green grass. The scale of the land is immense. And then what plant life there is is for the most part only an inch or two off the ground. It was quite easy to become confused, and think a seagull in the distance was an iceberg, or vic versa. One day I spent half an hour paddling across the bay towards our camp, only to discover that our camp was in reality a small rock, and we still had another bay to cross. Can you see our campsite way down there by the stream? 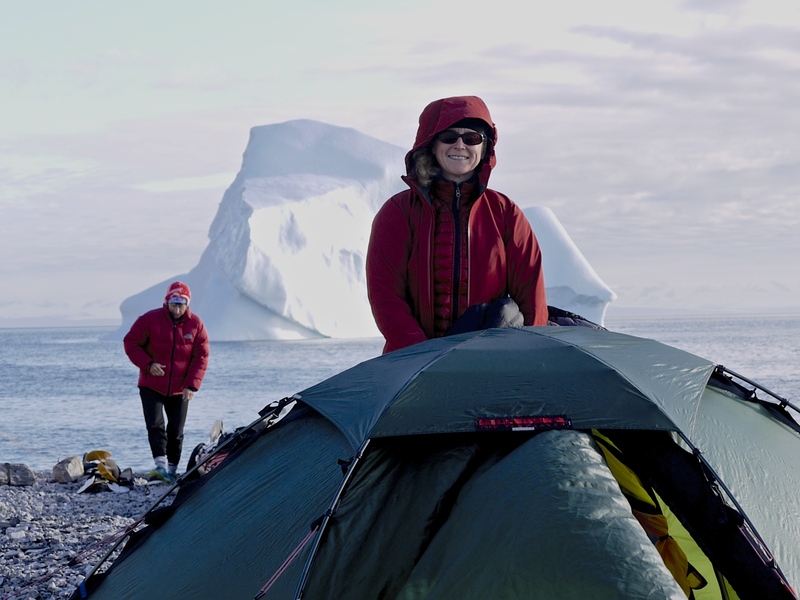 We experienced sea ice, and paddling and camping amidst stunning ice bergs. 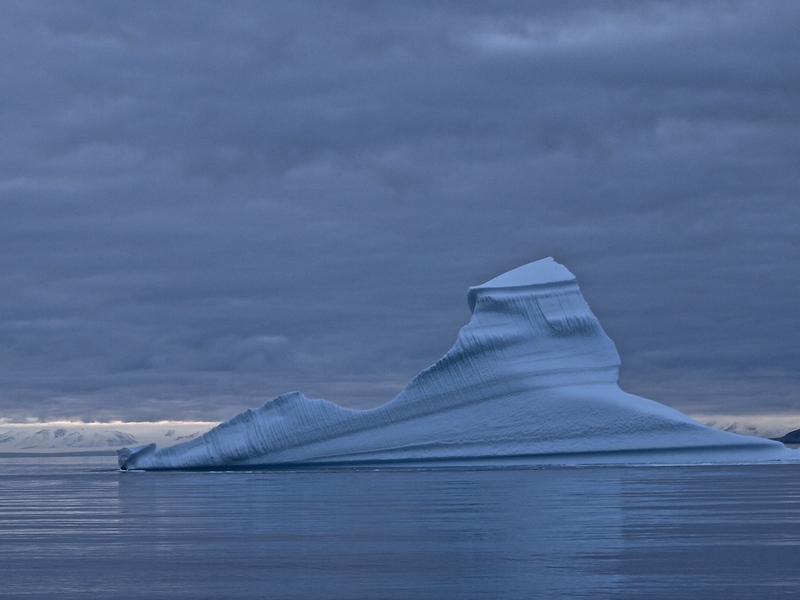 These are splendid things – massive chunks of 50,000 years old ice, perhaps having floated all the way from Greenland, to dazzle us with their indescribable shades of blue and amazing sculpted shapes. 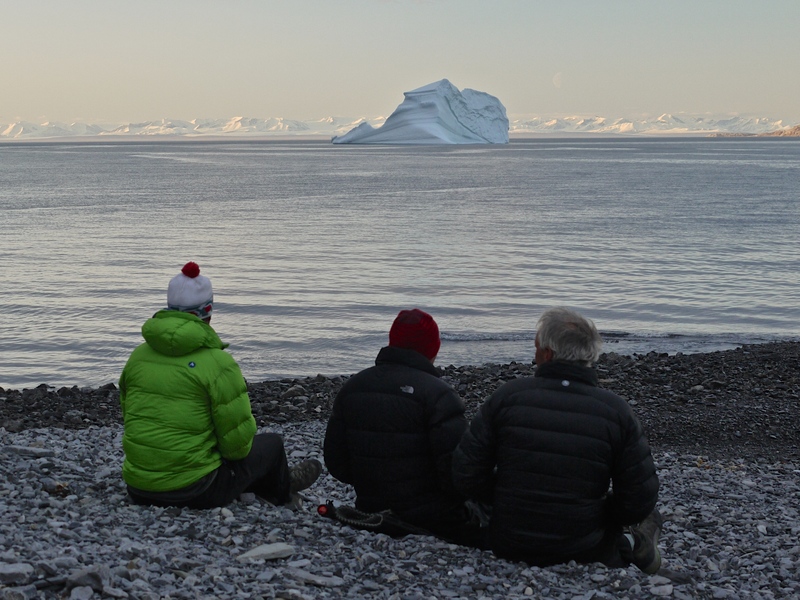 One of the highlights of our trip was the iceberg that one day arrived in front of our camp. 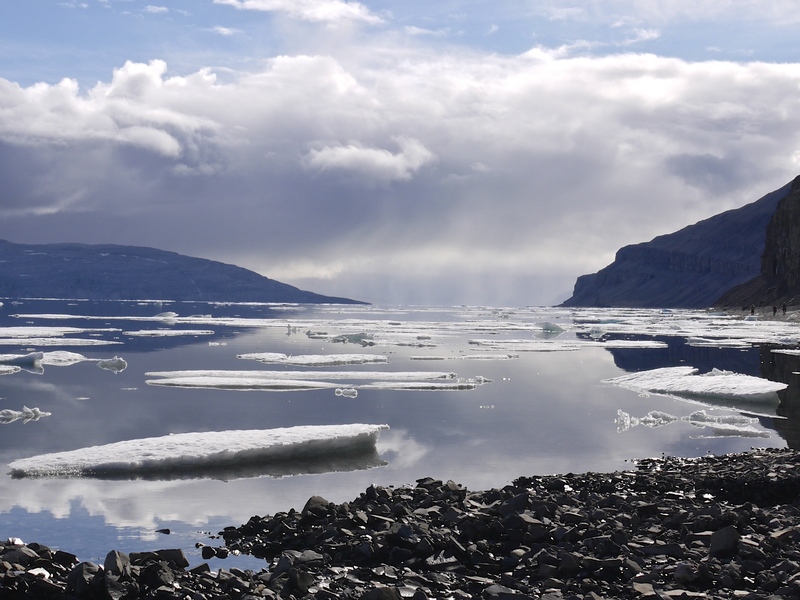 We gathered around to watch it before bed, (the camping version of gathering around the tv for the evening), and then awoke at 3 am to loud bangs, as chunks of ice calved off into the sea. The calved bits broke into myriad pieces, and the mother berg rolled and adjusted to a new position each time. Behind this was the snow covered peaks of Bylot, and the red sky of the new dawn. 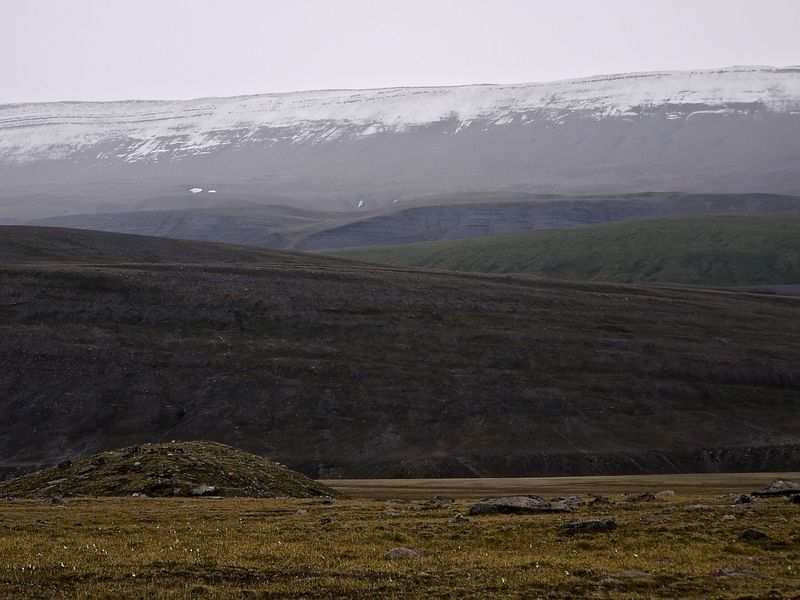 Although the landscape is harsh and sparse, we saw lots of wildlife. Snowy owls, snow geese, a rough legged hawk family with 4 chicks in the nest, kittiwakes and jagers and the spitting glaucous gulls. 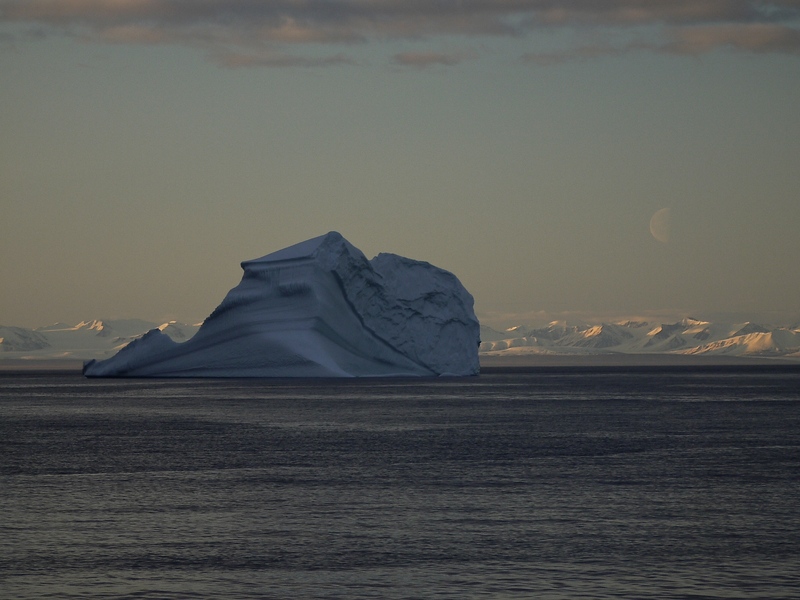 We had the company of the curious seals – the lovely spotted seal, the elusive harp seal and the whiskery bearded seal. 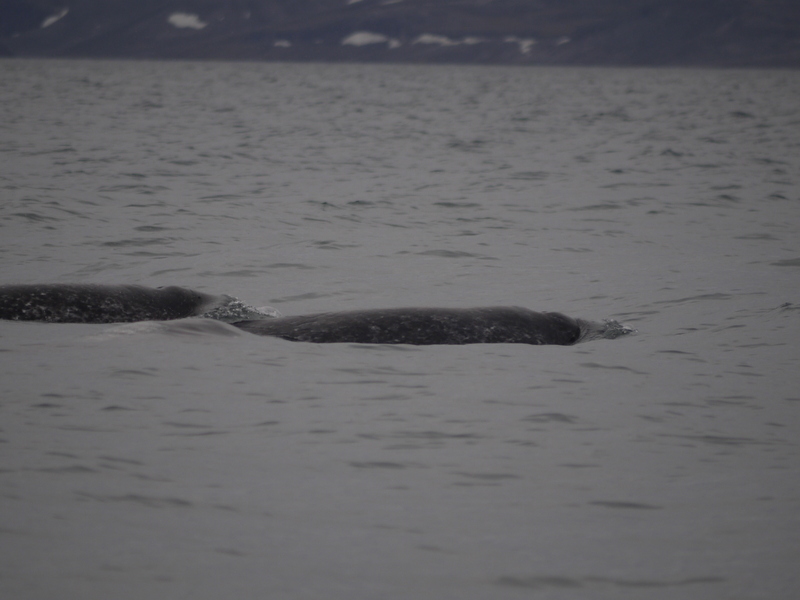 We even saw a few Bowhead whales, including a mother and calf. But by far and away the most breathtaking experience of all was seeing the narwhals. Narwhals are medium sized tusked whales. Their tusks were originally thought to be from unicorns, and I think in fact they must be a kind of unicorn. Magical, mysterious, and little known. 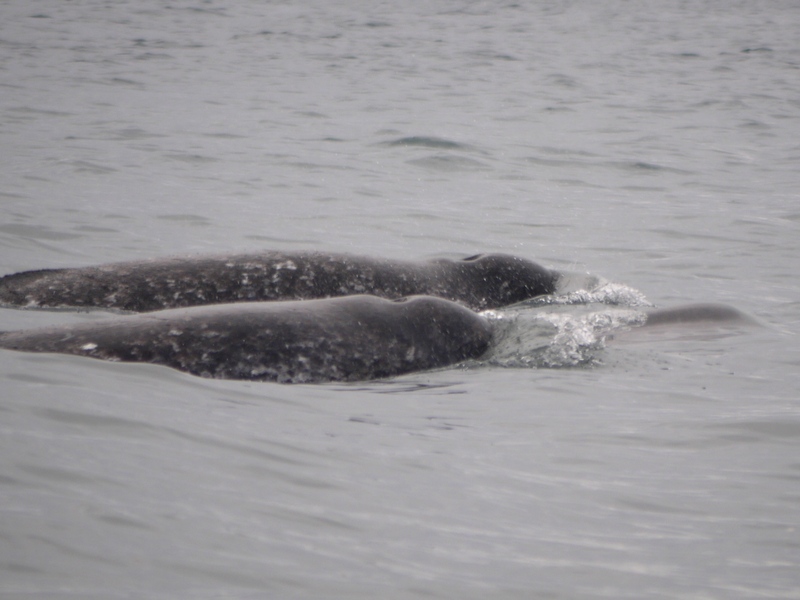 They are shy but sociable grey and white speckled whales, numbering around 100,000. Very little is known about them, but they are known to be in the Pond Inlet area, and we saw HUNDREDS of them. It was amazing. One of the best experiences of my life was the morning we came out of the tent to see them swimming by, right in front of the campsite. When they are traveling they skim the surface of the water, bobbing up and down, gently exhaling and inhaling, like little friendly signs. Commonly there will be a small group of 6 or 8 whales close together, but these small groups aren’t alone. That morning we saw endless pods going by. We watched them for an hour, nonstop, and we estimate in that time we saw 400 of them. Big and small, young and old, all traveling intently past, ghosting along at the surface of the water. It filled me with awe and wonder, and gives me hope for this planet, and hope for us all. The presence of so many magical creatures, who remain so mysterious and unknown to humans, in spite of our technology and science, is a treat to see. I will never forget the feeling I had that morning, kneeling on the wet sand, in the wind, in a wet and grey world, watching the whales go by, and feeling like I was in the presence of greatness. It felt like all that is beautiful and wonderful about this life, and the mysterious life force behind that, were reaching out and caressing my heart, saying ‘this is the beauty and the mystery, and you are a part of it’. 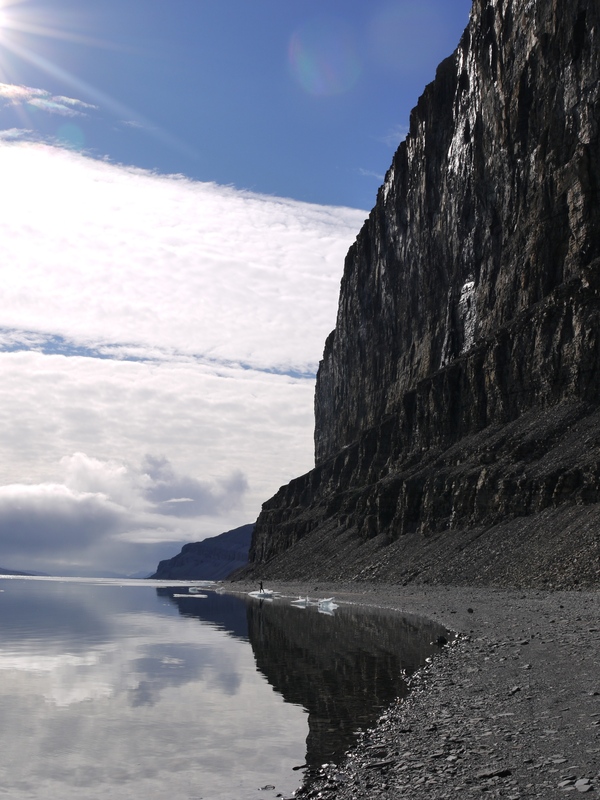 This entry was posted in North of 60 and tagged Arctic, Baffin Island, Blackfeather, Canadian Arctic, kayaking, Narhwal, Pond Inlet. Bookmark the permalink. I was waiting anxiously for this posting. I knew that you would have spectacular photos and a very in depth and thoughtful take on this latest adventure. How lucky I am to be able to share this amazing part of your life. My deepest thanks, dear Friend. Thank you Tandi for this lovely and informative adventure in a land we will never know. You made it real with your wonderful photos and descriptions. It must have been an amazing experience. Yes, it was amazing. I’m so pleased you enjoyed hearing about it. My heart is happy for your heart. The first thing that stopped me was: Baffin? We have a Baffin Bay here in Texas, far south on the coast. It’s one of the harshest and loneliest of our bays, quite rocky in places and now at all suited for sailboats. In fact, your Baffin and my Baffin are connected, through Captain Mifflin Kenedy (1818–1895). 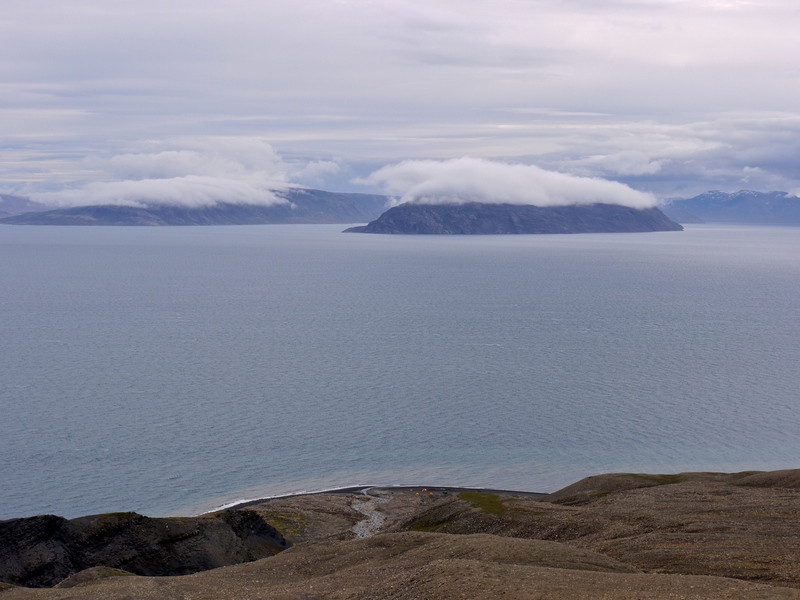 After visiting the Arctic Baffin Bay as a young man, he gave the same name to the bay in Texas — not because they were at all alike, but because of the remarkable contrast between them. The fellow had a sense of humor! The narwhal is such a wonderful creature. I only saw orcas while cruising Glacier Bay (“only”, she says!) but I suspect some of the silence was the same. Looking at your photos in combination with your words is magical. It brought to mind Judy Collins’ ‘Farewell to Tarwathie’, one of the few songs that always has seemed to me to capture that spare landscape well. Beautiful post. I understand the time it took to write it — likewise for a comment.